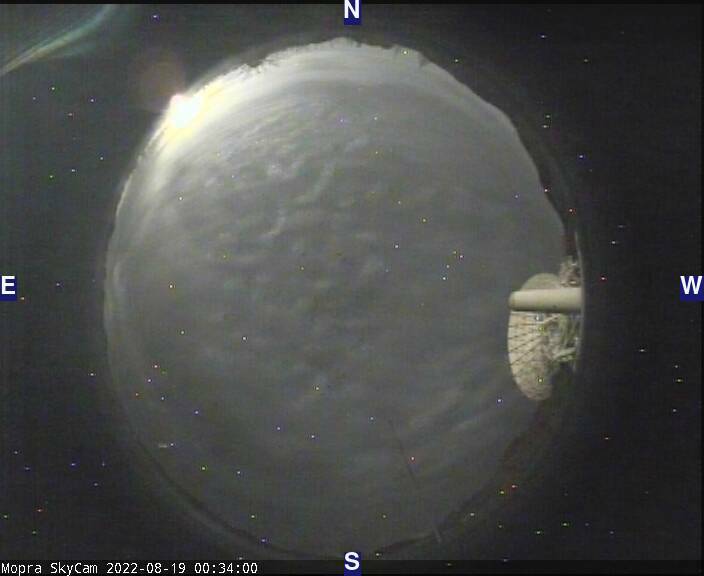 Home > Day 1 of Observing: Check the Sky! Other bugs occur surprisingly often. One of the first steps in preparing your observations is choosing your sky fields. Because the atmosphere is constantly wobbling and wobbling around, and because the telescope bands aren’t completely stable, as we observe we take measurements every few minutes on the sky somewhere near to what we’re looking at, and use that to control for any variation in the system. This sky subtraction is just that: we subtract our sky measurements from our source measurements in order to get something mostly flat and even. But for this to work, you need to find a patch of sky that doesn’t have any emission. GAH! How did this even happen? Look at that dip! Everything is not awesome! The profile (above) shows what happens when your sky measurement has a beautiful, strongly emitting molecular cloud in it – you get a massive drop in the spectrum of every pixel of your observations in the real field. Removing this is difficult, because the sky emission may be hiding something real. The two clouds might be so large that could be connected. So it’s easier to just avoid the problem entirely by being extra careful and testing your sky fields in advance. In our case, we choose our sky fields by looking at the <a href=”https://www.cfa.harvard.edu/mmw/MilkyWayinMolClouds.html”>Dame,Hartmann and Thaddeus (2001) Milky Way CO Survey</a> which is a complete survey of the Galactic Plane at a much lower resolution than ours. Black is emission, white is possibly noise. In this instance, I decided to take a chance on $l=269.5^\circ$, $b=+2.5$ as our sky position – using $b=+3.0$ as the reference for it. While it’s possible that there’s a faint cloud that occurs across both of these points, from the plot above that seems unlikely. Once we know what we want to look at, we write a schedule file, which is a fairly simple program that lets the telescope know where we want to look and for how long. The image above shows a sample from the schedule file, ignoring all the messy header bits, which says that for step 3 of our observations we want to observe the reference at $l = 269.5^\circ$, $b=+3.0^\circ$ for 60 cycles, and then for step 4 it should look the signal source for $l = 269.5^\circ$, $b=+2.5^\circ$ for 60 cycles again (a cycle – how frequently we read out the data – is 2.048 s long, a number that computer geeks will recognise as $2^11$ ms). Then when observing, we tell the telescope control system (TCS) to run that prepared schedule when the object is well above the horizon, and about ten minutes later, we have our observation. I’ll skip over how we go about converting the raw data into something prettier for the moment, and just show the end result. As you can see, there are two strong signals here, one in emission (the positive temperature spike, from our signal), and the other in “absorption” (the negative spike, from the reference position). This is a bother in that I now have to choose a second reference position to investigate, but on the other hand I’ve found two places which might be worth investigating later on. The other position observed was $l=269.5^\circ$, $b=-2.375^\circ$, which also shows emission. This is more what we’re used to, a lovely bright emission line at ~+5 km/s, which means that this sky position is similarly unusable as a reference for the survey. But at least we know there is unlikely to be any emission at $l = 269.5^\circ$, $b=-4.0$, which was used as the reference position here (there are no negative spikes here). Clearly I’ll have to pick a few more positions and try again tomorrow night. But for now, have a “clean” sky spectrum from $l = 349^\circ$, also taken yesterday. Hooray! Our temperature scale now only goes to a maximum of 0.8, which means that we’re right down in the noise for this observation, and there’s no obvious spikes. I’m a little worried about how much noise there is, so I will probably take this again later to be sure, but for the moment, we can safely assume that this will be a good sky reference position for the $l = 349^\circ$ field. Next Post: Day 2: Check the Sky (Redux)!